In “Mental Training Sessions with Doc,” Dr. Patrick Cohn answers your sports psychology and mental training questions about how to bring your practice game to competition and how to determine what’s throwing your focus off before game time. Watch the video to see what tips Dr. Cohn gives to this sports dad to help his son. Bring Your Practice Game To Competition Today! 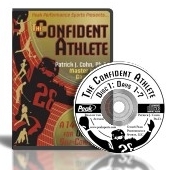 The Confident Athlete CD program helps athletes learn powerful pregame routines to stay calm, focused, and poised in competition. Get Our Weekly Mental Game Tips! 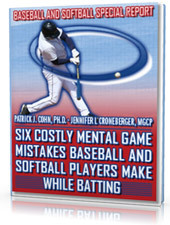 Get instant access to a Mental Game of Baseball and Softball FREE report. 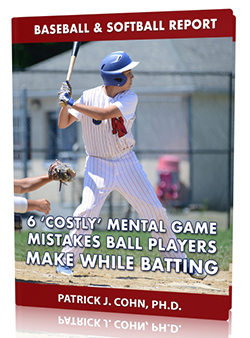 Discover if you are making one or more of these “costly” mental game errors at the plate! How your mind can be your best or worst asset during batting. If you are using your mind effectively to get a hit. 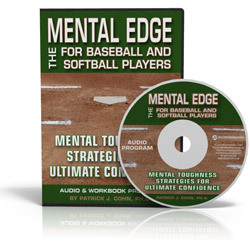 A critical mental error that can erase your confidence at the plate! How to prepare your mind using an at-bat routine.